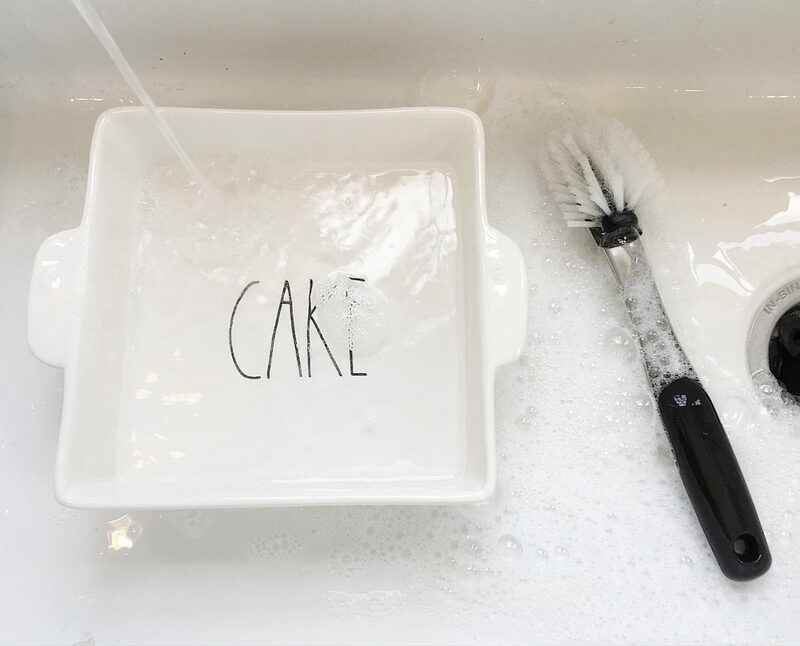 Q U E S T I O N // Is it dishwasher safe? Rae Dunn told me that her pottery is dishwasher safe. But she suggests you hand wash your items. She said “the dishwasher can cause a lot of clanking and cracks might be caused if the dishes come in contact with one another”. 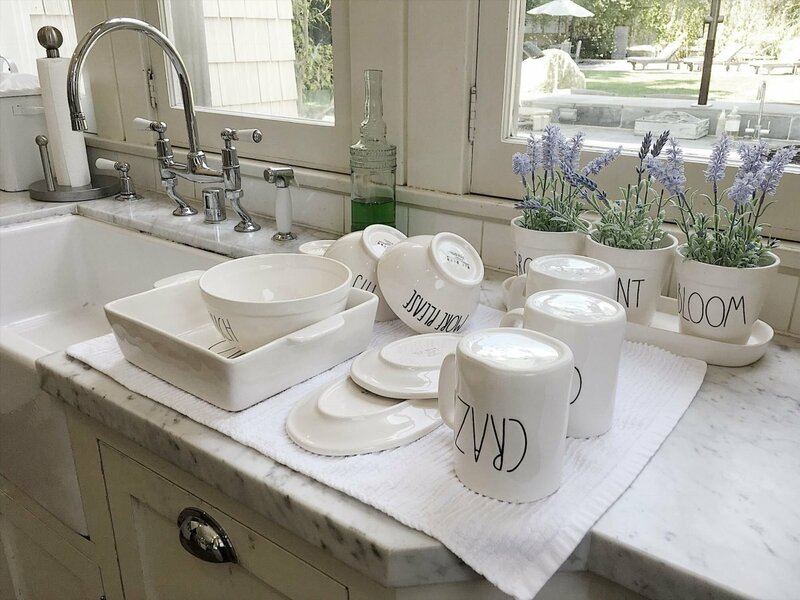 She told me that she always washes her favorite clothing items by hand and suggested we might want to do the same with our Rae Dunn collections. Q U E S T I O N // Can you put it in the microwave? Yes, you can! Microwave away! Q U E S T I O N // Can you put the BAKE and CAKE pans in the oven? Yes. That’s what they are for! Q U E S T I O N // Can the planters withstand constant watering? Q U E S T I O N // Can you leave the bird houses outside? Q U E S T I O N // What do you do if you notice a crack? Rae mentioned that a crack could happen in shipping, in a shopping bag or even in the dishwasher. If you notice a crack then you should display the item and refrain from using it. She suggested putting plates on a plate hanger or putting mugs on a shelf. T H E B I G G E S T Q U E S T I O N O F A L L // Are we better off displaying our Rae Dunn to keep it safe or using it to enjoy it? Use it! Just hand wash it to prevent from cracking! Thank you so much, Rae! You answered so many of our most pondered questions. 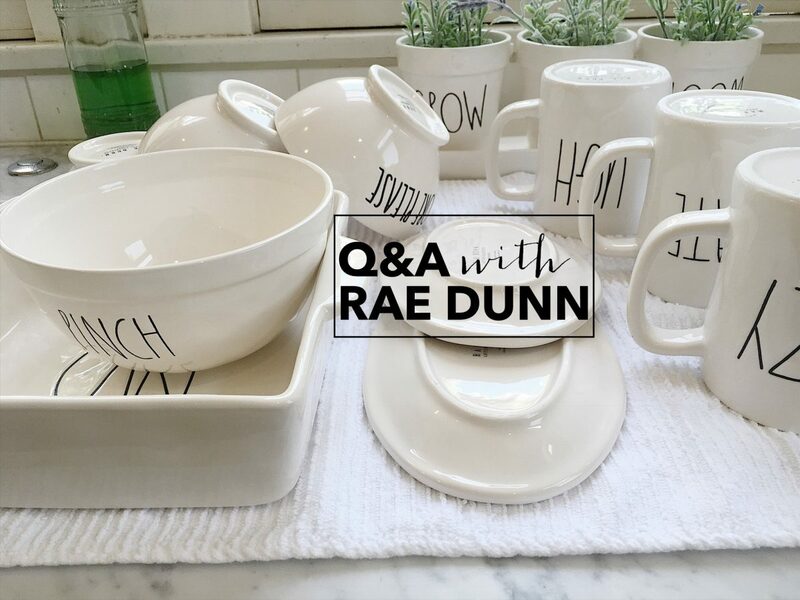 It looks like Rae Dunn clay just got better… not only is it fashionable, but it’s also functional! Ha! I love how we can choose a mug for a mood… and there are so many moods to choose from! I totally agree! The unicorns we MUST preserve! The glaze on my planter spider cracked from being outside ???? Thank you for sharing! How awesome that you had the chance to speak with her. I love all of my Rae Dunn! It was a very cool experience! She is super sweet and I was so nervous! Ha! Thanks for taking the time to read! Why does she only sale to TJ Max and Marshalls? I love my little collection but want more!! Just found your site and totally in love! Thanks for the great info on Rae Dunn. I use my mugs every day and love it! I have the gobble platter.. will it be okay to warm up turkey on it when I get to my mom’s? Yes. She told me they are all oven safe! Are the platters (not baking pans) oven safe? 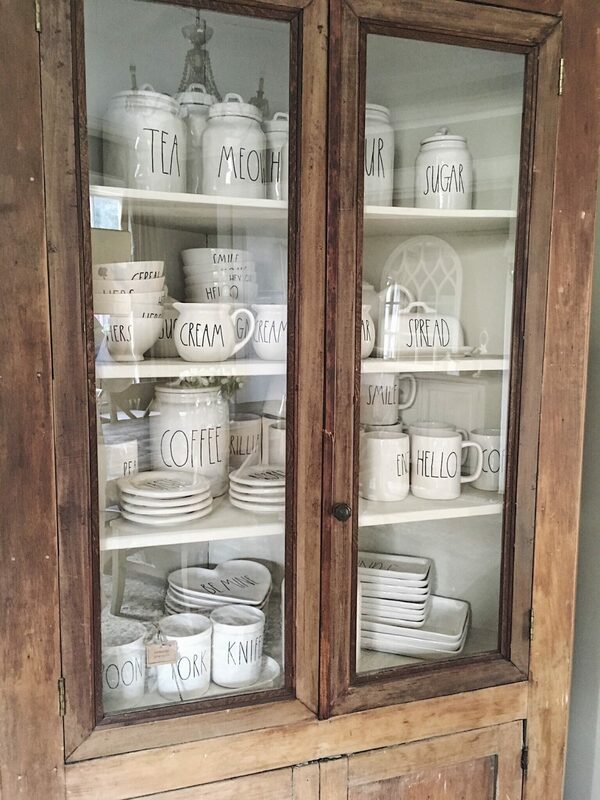 Where did you buy your display cabinet? Can future lines be lead free please?! I’m just finding out how absolutely high the current and past levels are of some of my most favorites. Sadly until that happens, they will just remain as just unused decorative items:( thanks! Becky I too just found this out this afternoon!!!!! I am deeply concerned about the amount of Lead present in Rae Dunn. How does Magenta ensure compliance with Prop 65? How do Prop 65 levels compare to other similar safety standards? Magenta has strict standards for each of our products in both safety and quality. All of our products are subject to the California Prop 65 tests. Other countries and safety organizations have reviewed known studies and scientific evidence to produce safety guidelines, which determine the levels of heavy metals that can be consumed on a daily basis without causing harm. The Prop 65 levels are among the most stringent. In comparison, as Prop 65 allows for 0.5 micrograms of lead per day, the United States FDA allows 75 micrograms per day, the FAO/WHO and EU allow for 250 micrograms per day. I got the icon dishes last night and after washing they had dark water spots in the clay. Anything I should do to them? Upon getting home with a piece I discovered it has a chip, how do I repair it? the tumbler says not microwave safe but everything else says it is?